To me, zucchini defines summertime. Growing up in my parent’s garden in Chico (where squash could grow into baseball bats in a weekend) there was always more zucchini than we knew what to do with. Thus, I have a really hard time paying for zucchini – but here in the fogbelt, a girl has to do drastic things like wear wool socks in July and buy zucchini at the farmers’ market if she wants to believe that summer does exist, somewhere. I love zucchini in many forms, and never really tire of it, but this has become one of my favorite ways to eat them. 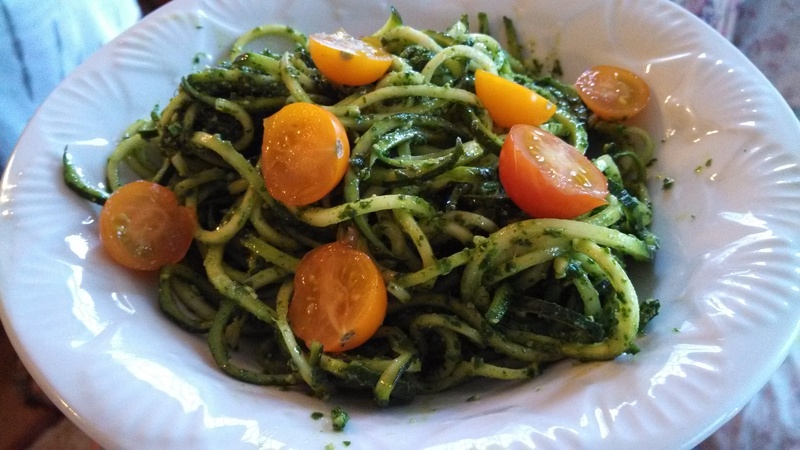 Zucchini pasta is the ultimate summer dish; you can use something that is abundantly available and you don’t even have to cook it. It is as fresh as it can get, super healthy, extremely easy to make and has a wonderful pasta-like texture that takes on sauce very well. Skeptics, try it before you hate on it. I have brought this to potlucks before and people didn’t even know that it wasn’t “real” pasta. I also think that this pasta would hold up well in a stir-fry if you were going for a Chinese-style noodle dish. 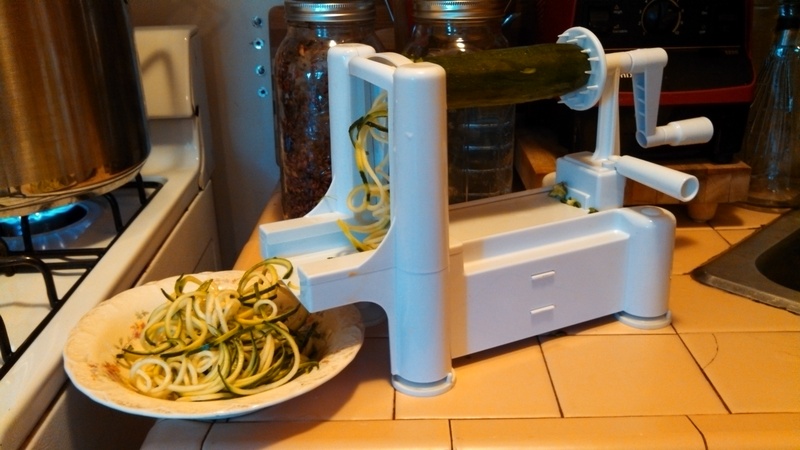 All you need is a veggie spiralizer like this. I purchased mine at the Living Light Culinary Institute marketplace in Fort Bragg. You can also order them through the Living Light online store. It’s very simple to use. You just mount the zucchini and turn the handle to crank out the noodles. 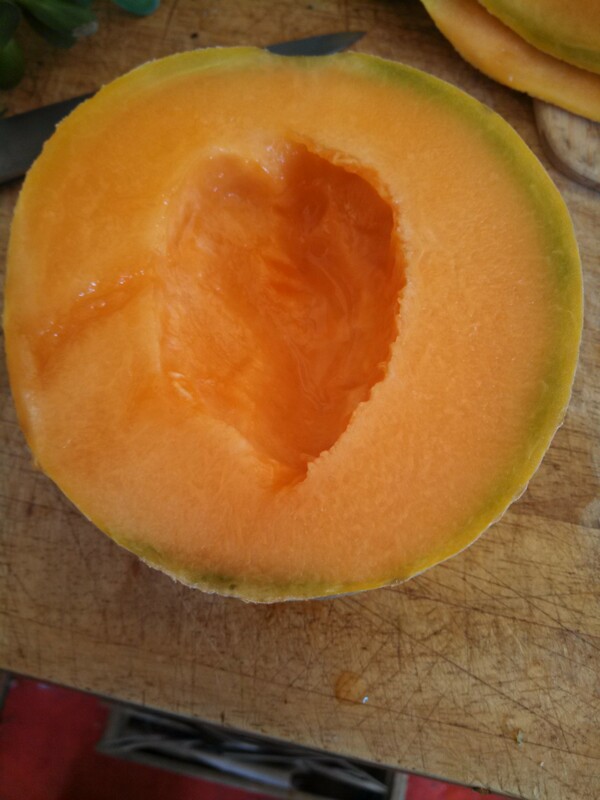 It’s easiest to use straight squash, or cut them into smaller chunks if they are crooked. 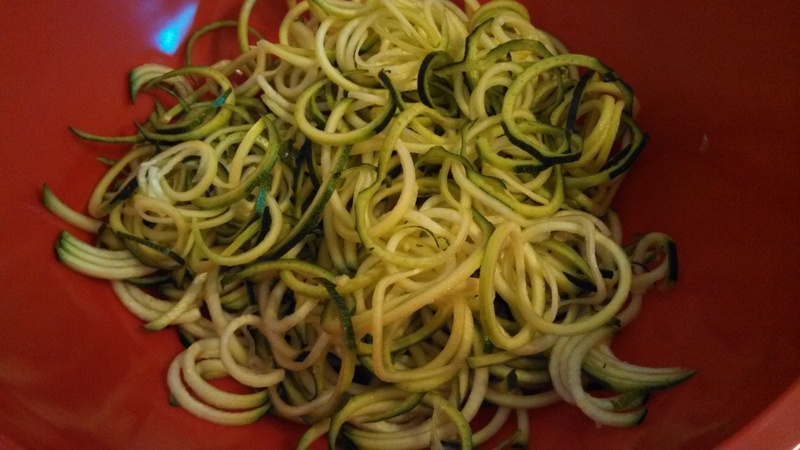 This is what the spiralized zucchini noodles look like. You can use any kind of sauce or dressing on your noodles and add other veggies, herbs/seasonings, and cheese. This time I mixed in some of Mom’s famous parsley pesto and sea salt. *Pesto lovers: using parsley is a great option when the basil isn’t growing yet. Topped off with some sungold cherry tomatoes and ready to enjoy! 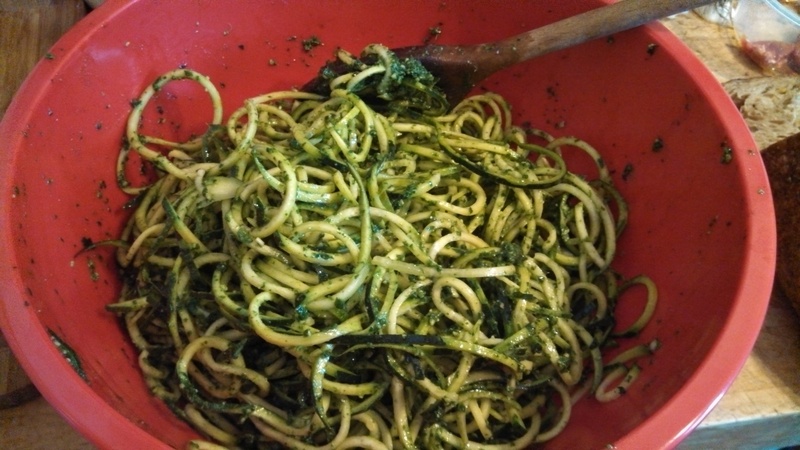 Categories: Cooking, Vegan | Tags: daily report, how to, Living Light, parsley, pesto, raw, spiralizer, zucchini pasta | Permalink. 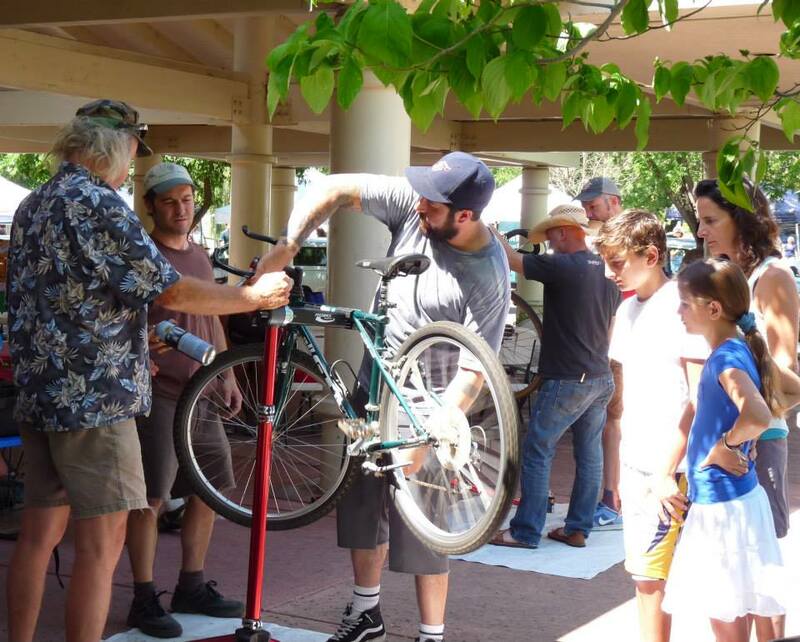 People often ask us what has been the hardest thing about eating locally. Most of what we do is not inherently difficult; the biggest challenge is rearranging one’s life around cooking whole foods for every single meal, every day. This requires a complete lifestyle overhaul. We must always think ahead and I rarely leave the house without some kind of food stuffed in my purse. So, the hardest thing is giving up anything premade, whether it be a box of crackers or cereal, a bag of chips, or a can of beans. 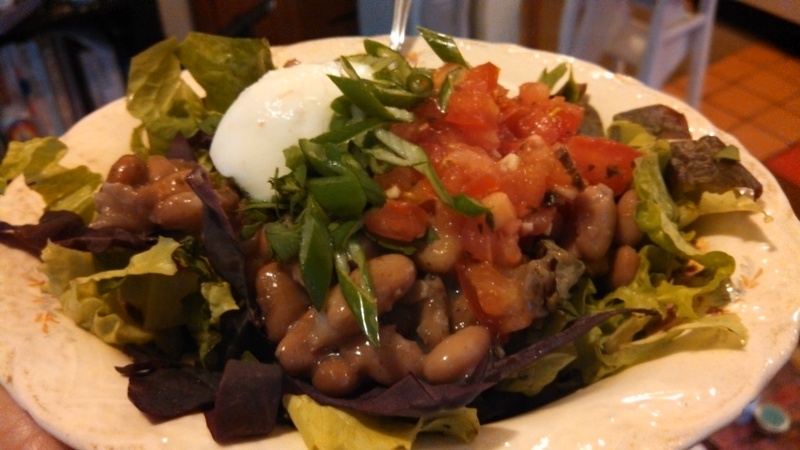 Honestly, I had never cooked dry beans from scratch before this year. It took us months to track down local beans, and when we did it was tremendously exciting to have a non-animal protein source. 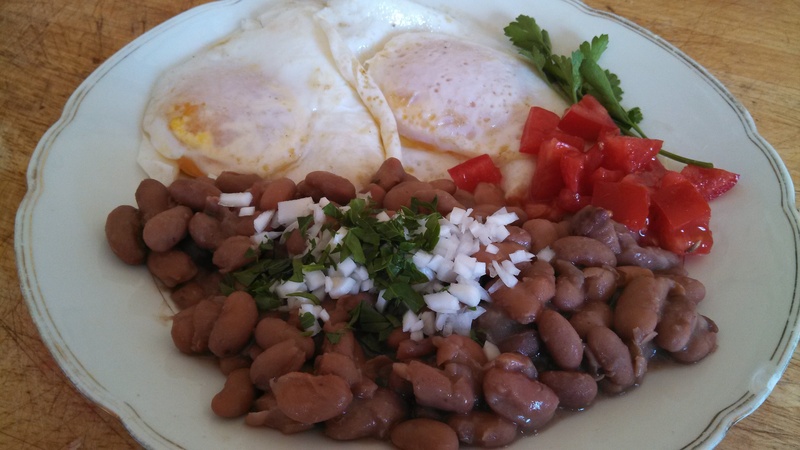 These speckled bayo beans came to us via Westside Renaissance Market and they were grown by Guinness McFadden in Potter Valley. When I made the first batch, I ate them every day for nearly every meal for a week and it felt anything but pedestrian; it was like a bean miracle. The simple becomes the miraculous when you have gone without. 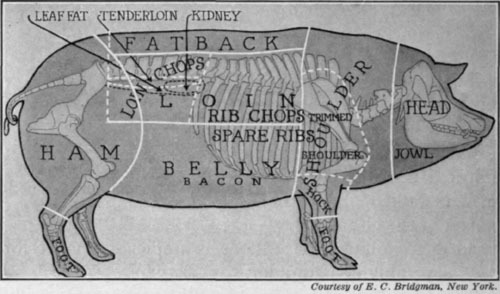 We have said many times that the point of this project is not to get everyone to do what we have done and dive into the deep end of the local food pool. Rather, we hope that people will start looking at their own plates and think about how they might start connecting with their local food supply chain. There are lots of ways to do this – from making strawberry jam to baking bread or simply making time to pick blackberries on a lovely summer day. 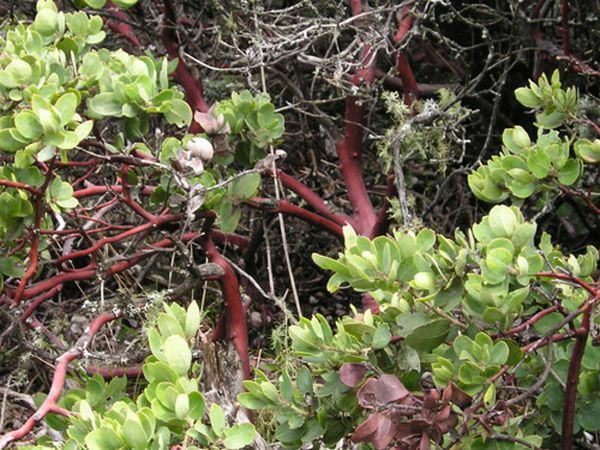 It all starts with getting closer to the source and cooking from scratch. The more we do this, the more we realize we are capable of. Here is my challenge to you: take one thing that you usually buy in a box, can or bag, and try making it from scratch. Just one simple thing, like beans. 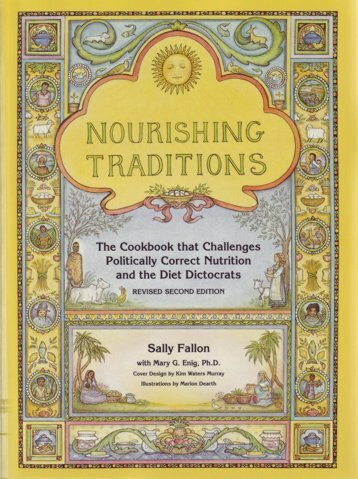 And if that’s where you want to start, here’s the recipe, borrowed from Nourishing Traditions (an indispensable book to have on hand in the whole foods kitchen). Cover beans with warm water. 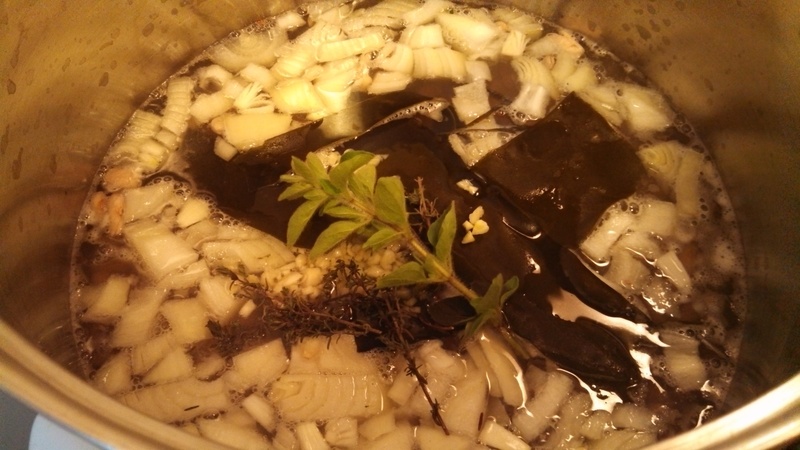 (For black beans, stir in whey or lemon juice). Leave in a warm place for 12-24 hours, depending on the size of the bean. 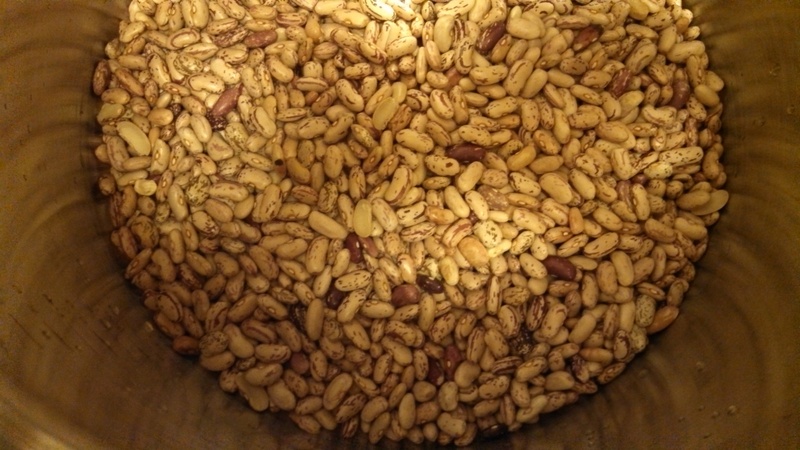 Drain, rinse, place in a large pot and add water to cover beans. Bring to a boil and skim off foam. Reduce heat and add optional garlic. Simmer, covered, for 4-8 hours. Check occasionally and add more water as necessary. Season to taste. 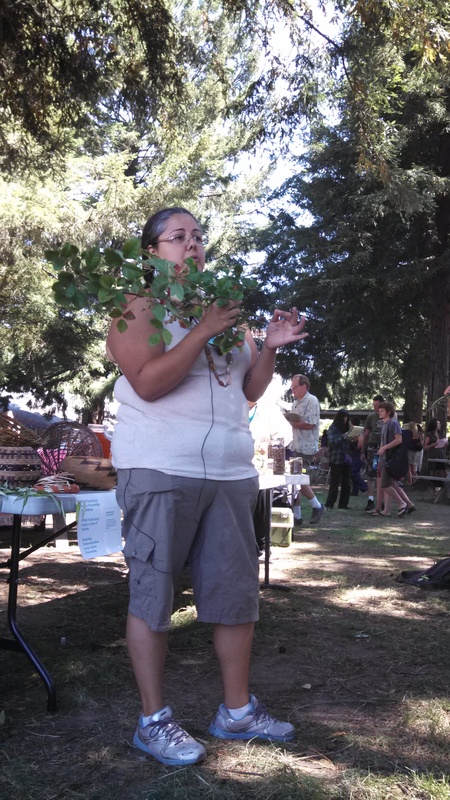 Categories: Cooking, Recipes, Vegan, Vegetarian | Tags: bayo beans, cook, daily report, dry beans, eat local, how to, McFadden Farm, mendocino, Nourishing Traditions, recipe, westside renaissance market | Permalink. In the natural division of labor in our domestic pact, I make the yogurt and Gowan makes the cheese. It’s largely based on equipment: I have a gas oven, and she has a dehydrator. But, I like my job a lot. It might have something to do with a genetic predisposition to yogurt (I am Greek after all). 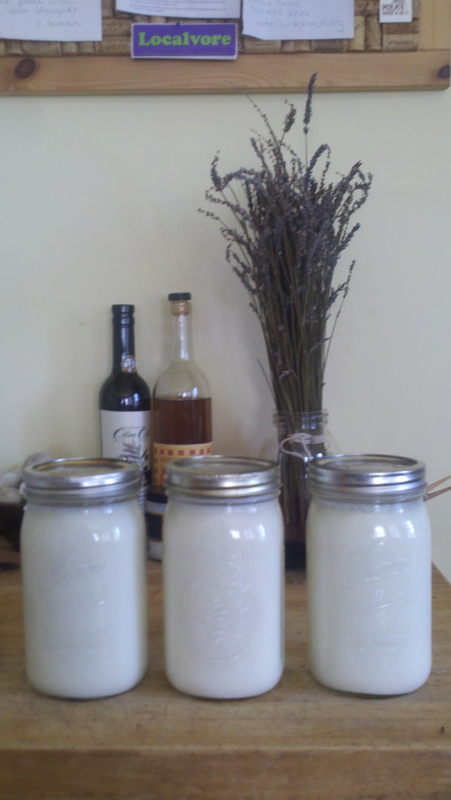 But, I like the many steps to yogurt making and find the process grounding and meditative. And, now I will share all my secrets with you. The thing about making yogurt, and making most things really, is that none of it is very complicated. It just requires a few simple pieces of equipment and good timing. You can’t let the milk go bad, make sure you don’t run out of starter, and make the time to get it going and also be sure that you will be available to take it out many hours later. (I have ruined yogurt due to late night escapades…) So, it is really an act of being present more akin to meditation than cooking. But, maybe they are one and the same. Making yogurt is also a lesson in freedom. A gas oven – this is important for this method. If you don’t have a gas oven, you will need to find another way to incubate the yogurt at a steady temp (like a yogurt maker). Some people put it in a cooler, wrapped in towels, next to bottles of hot water. The oven is just easy and the temp seems to stay steady. Cow Milk. We are lucky to have fresh milk right from the udder. You can use any kind of milk – store bought, Organic, rBGH free, but we strongly recommend using whole milk – always. I have ranted about the integrity of whole milk in another post, so I will not belabor this point here. It is possible to make yogurt with other kinds of milk, but cow is what we have, so that’s what we’re using right now. It’s true that all milk is breast milk, and we recommend getting as close to the breast as possible. It really will taste better. A little bit of yogurt for starter – this can be from your last batch, or from the store, or from a friend (which is my favorite place to get it). You don’t need much, but we’ll get into that later. Pour milk into saucepan, insert the candy thermometer and begin to heat on low to medium low. Stir frequently. Do NOT let the milk burn. That is your number one priority. I post up next to the stove and try not to leave it, because I burned it once and I will never let that happen again. Burnt milk = gross yogurt. 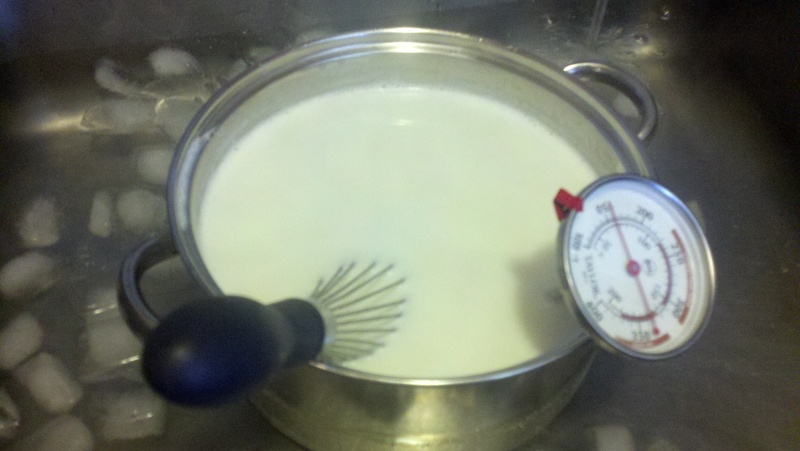 Keep stirring diligently until you raise the temp of the milk to 180 degrees. Stirring keeps it from burning and keeps the temp even throughout the pan. Prepare an ice bath. Once the milk has reached desired temp, turn off the burner. Place the pan in the ice bath and allow the milk to cool to 110 degrees, stirring occasionally so it cools evenly as well. Turn the oven on to the lowest setting for a few minutes while you complete the next step. Turn off oven, and then place jars on oven rack for incubation. The oven will retain warmth from pre-heating it, and the pilot light will keep it warm enough for the cultures to get happy and do their thing. Try not to move the jars at all once incubation begins – it makes the yogurt unhappy. Leave yogurt in the oven for 8-12 hours, depending on desired thickness – or when you remember to take it out! I like to do this in the evening so that there is fresh yogurt in the morning – which is the best thing ever (and so that my oven isn’t occupied during the day). Remove and enjoy straight out of the jar! If you are Greek like me, or just have really good taste, you may want to strain your yogurt to make it even thicker. To strain it, you line a colander with cheesecloth and place in a bowl. Pour in the yogurt and let it sit in the fridge overnight. The whey will separate, making your yogurt even thicker, creamier and more delicious than it already was. Save the whey for other cooking uses. This is what I do when I have the patience to not eat it right away. 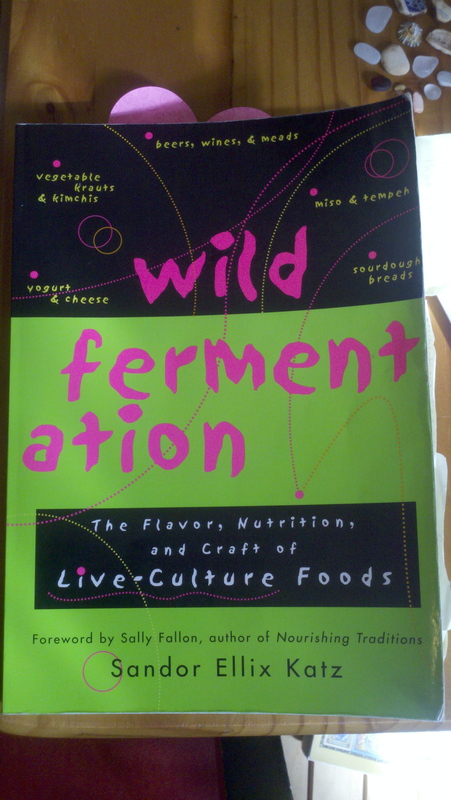 Categories: Recipes | Tags: county, ferment, fresh, how to, locavore, make, mendocino, milk, recipe, simple, yogurt | Permalink.